I read another book for the kids! Click here to watch Green Eggs and Ham. Thanksgiving is coming faster than ever this year and I have some recipes I’m going to do my best to get up here while we still have time. 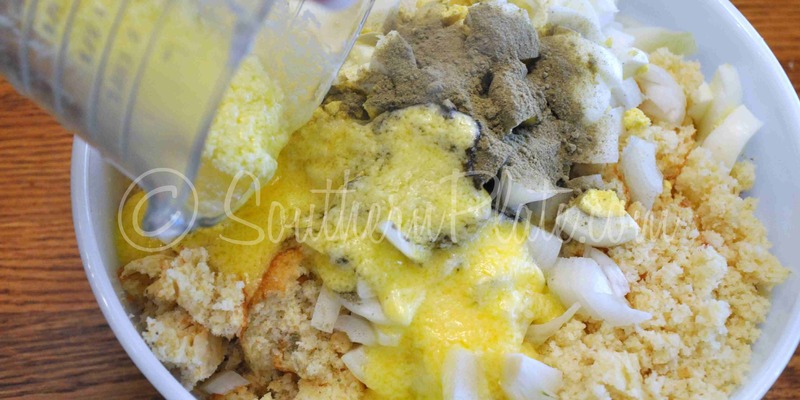 Next week I’ll also post my full menu of Thanksgiving suggestions complete with tutorials but today I’m going to show you how easy it is to make moist and delicous cornbread dressing. Yesterday as I chatted away about Thanksgiving on the Southern Plate Family Facebook Page, Laurie Sawyer Johnson chimed in with a comment that just about summed it all up when she said. 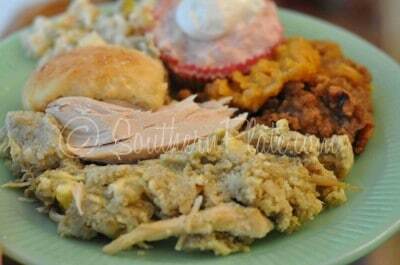 “Everyday is Thanksgiving at my house. We all have so much to be thankful for these days.” Amen Laurie, you are a wise woman. We all do have so very much to be thankful for and these days are ones in which I think we are better able to see just what it is we hold of true value in our lives. Yesterday I was talking to Mama about how lucky we are that we don’t come from money, that we come from financially poor ancestors and how this has shaped our view of what really matters in life. I would like to say that I’d be the same person if I was brought up in a financially wealthy family but I really don’t believe I would be. If anyone could raise kids amidst money and have them walk a straight line though, it would have been my parents. But you know, we never had much and so Mama and Daddy compensated by spending time with us, making things from scratch, recycling household items into toys and overall investing time in their kids when they couldn’t invest money. That taught me integrity, values, and created in me a thankful heart while keeping my eyes ever open to the richness of relationships. Every time I look around me now, I can’t help but be humbled and amazed at how much I have to be thankful for. Happy Thanksgiving to you, for the next 365 days. You’ll need: cream of chicken soup (two cans), stick of margarine or butter (whatever you have), ground sage, turkey, onion, and broth. Now I’m using my broth from cooking the turkey but you can use canned broth if you like (just go by the measurements in the ingredients list below). You can also omit the meat if you like, or even use a rotisserie chicken in place of having to cook it. 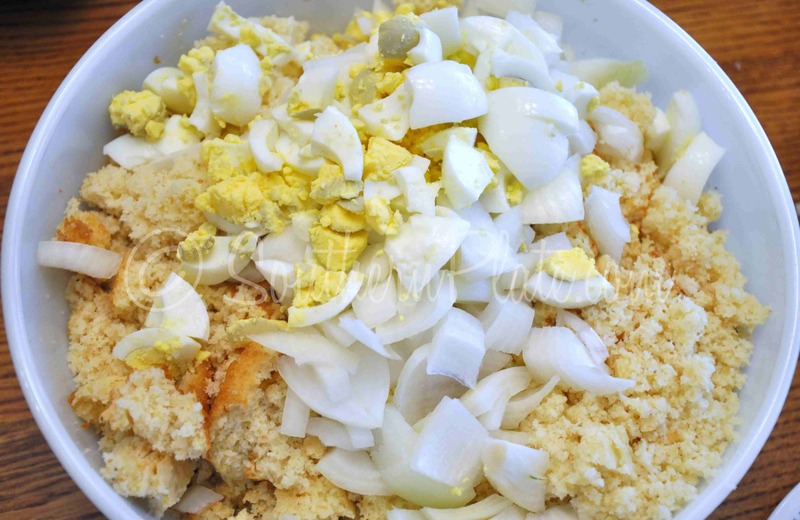 Are you looking at this and thinking “Well my Mama always added chopped celery” or “My mama never used onion…” then go ahead and add celery or leave out the onion. Make it your own! You’re going to need some cornbread, about two quarts worth which is pretty much a double recipe (get Terri’s recipe by clicking here). I just cook mine in a 9×13 pan and then I know I’ll have enough. Don’t worry about cooking it in cast iron or anything like that because we’re going to saturate it with broth and lots of good stuff anyway so a crispy crust isn’t going to do you much good. Special thanks to Debbie Strum for my fine white corn meal that I used in this! You’re also going to need some chopped, boiled eggs. Mine were camera shy at first so I had to cut them up a bit and force them on camera. Don’t worry, I am much more understanding of people who are camera shy than I am of eggs. Muwahaha! Crumble up your cornbread. This is in a really really big bowl (I think four quarts). Cover and cook on low 3 hours and it’s ready to serve! 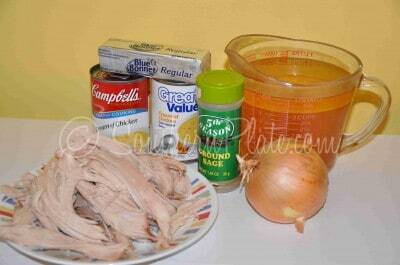 Set aside one can cream of chicken soup and the turkey (or chicken). 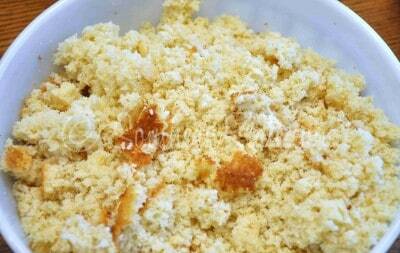 In large bowl, crumble cornbread and add all other ingredients. Stir until well mixed. 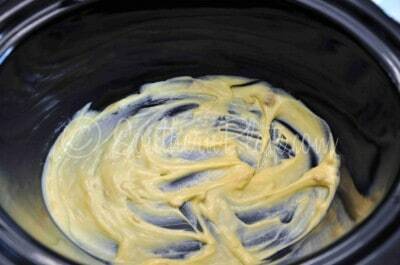 In bottom of 6 quart slow cooker, spread half the remaining can of cream of chicken soup. 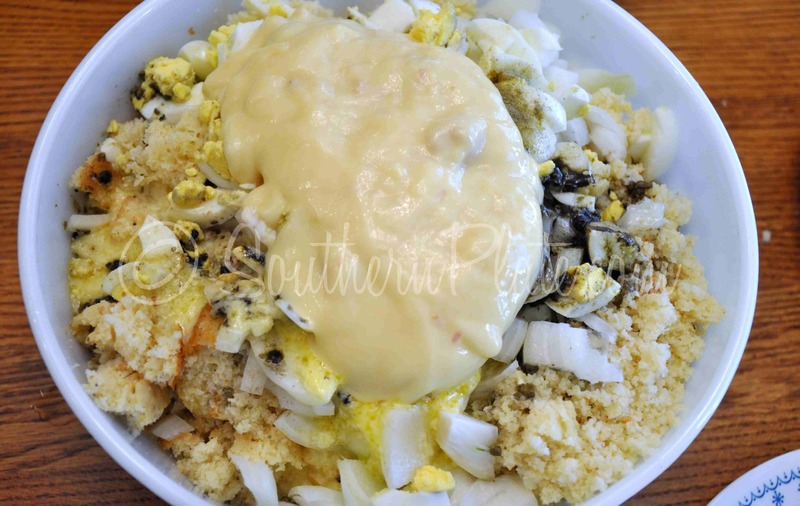 Top with ⅓ of the dressing mixture and ½ of the meat. 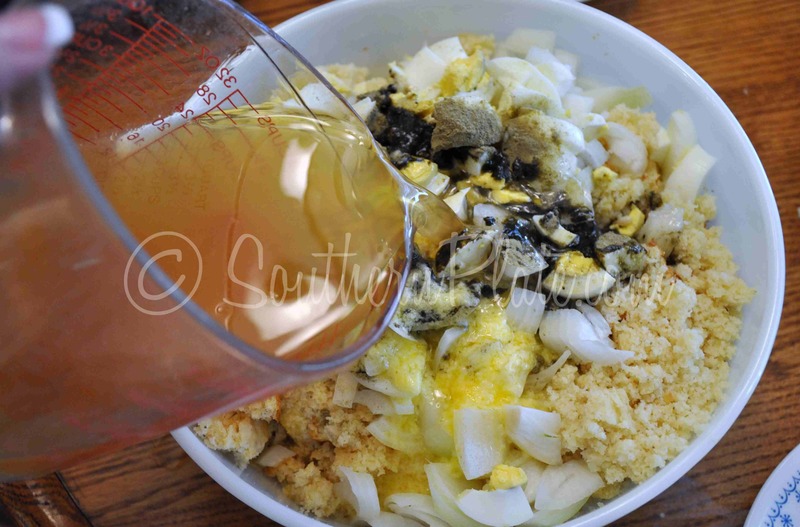 Add another ⅓ of the dressing and remaining meat, then the remaining dressing. Spread the rest of the cream of chicken soup over top. Cover and cook on low for 3 hours. Serve hot. *This recipe is on SouthernPlate.com using cooked chicken breasts and canned broth, you can find that post by clicking here. 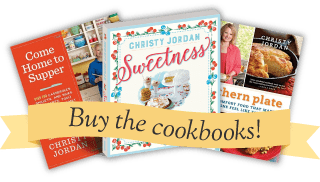 This recipe is also listed in the cookbook on page 128 using a cooked whole chicken as well. It is easily adaptable either way you go so I just thought I’d bring you another full tutorial for those of you who may be using turkey and broth from cooking the turkey. ~Meister Eckhart. Submit your positive or uplifting quote (or read some more!) by clicking here. Thank you again for all of your support of the book! They’ve lowered the price again on Amazon.com so if you’d like to get it at a discount you can click here to beebop on over there and save a little money! Yum!! I ready for some dressing and turkey!! Christy- when making in the oven instead of crock pot, would you still layer the cream of chicken soup? Thanks! This looks really good, thanks for sharing it with us. We are heading to Minnesota to see my mom at Thanksgiven and she is already telling me that she is looking forward to good old fashion southern cooking. I definately think this would qualify, plus with me packing food to take up there so I wont have to cook after a 12 hours drive this will be great for me to make a couple days ahead. I have been wanting a great dressing and this sound so easy.Thanks gonna try it this week. Thank you so much for your post today! I have tears in my eyes reading it. I feel the exact same way. My mom told me once that a long time ago, my grandma told her, “We may not have a lot of money, but we raise good kids.” I think that says a whole lot about the kind of people that I come from and I am very proud of that and I try to instill that in my kids. That the worth of one’s character is so much more than what kind of clothes they wear, or what fancy video game they have. Again, I just wanted to say thank you! This is almost exactly how I make dressing all the time. I don’t cook mine in the crockpot (it has to be in a certain old Club Aluminum pan that belonged to my grandmother) and we serve our turkey separately for occasions like Thanksgiving. The only other difference I make with mine is that we use 1/2 Cream of chicken soup and 1/2 Cream of celery soup. Makes the best dressing ever!!! Of course, only the best ever if cooked in my Memaw’s old pan!!! Yum! I am hungry and only have a salad for lunch! I bet dressing made in a crockpot is moist! 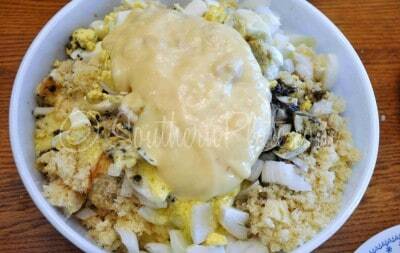 With all the meat and eggs in this recipe, it seems more like a main dish than a side dish! This recipe is almost the same recipe that I learned from my mother. The only differences are I make twice this amount and add 2 cans of Cream of Celery Soup in addition to the Cream of Chicken, omit most or all the onion ( I have some in my family who says it gives them indigestion. sniffles). I also add some poultry seasoning. I’ve always used chicken instead of turkey in my recipe too. 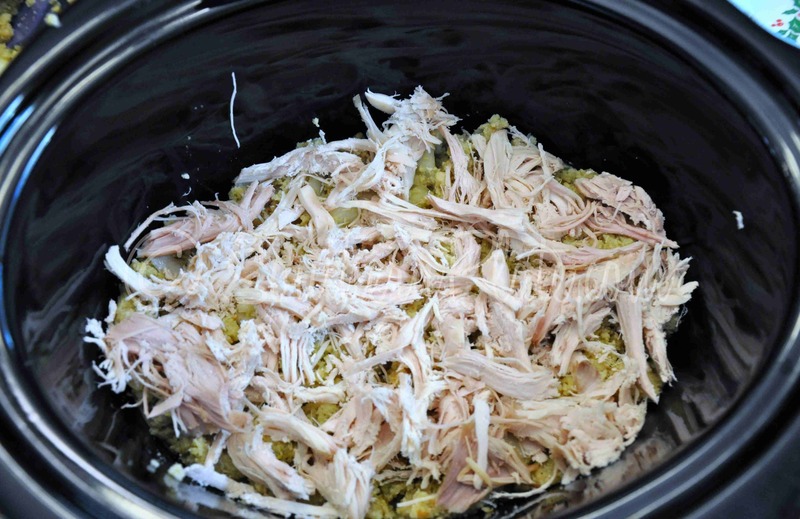 I use left over chicken to make a lovely shredded chicken gravy….. please don’t ask me how much of anything I use…(laughing) I season to taste and very seldom measure…. Oh my gosh I am so hungry for 1) cornbread made w/bacon grease (I am from Arkansas originally GO HAWGS! 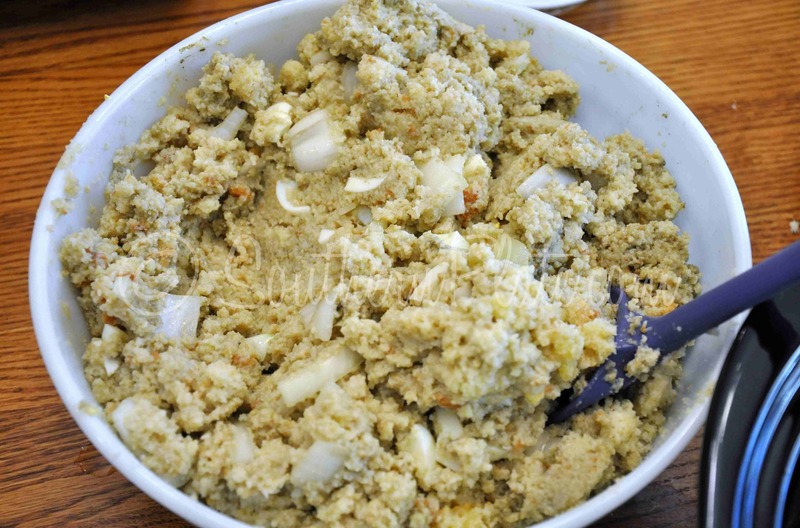 and remember the coffee can w/drippings in it); 2) this stuffing recipe. Might not wait for Thanksgiving since, as your other reader stated, everyday is Thanksgiving. Looks good, but I am on the celery side-gotta have celery! We also tend to use dry bread instead of cornbread in my area, but I love cornbread so I can see myself trying that. I use poultry seasoning as my spice. I come from a poor but proud family with five kids and I use all the things I learned with thanks that I know how to manage and make do. This looks wonderful! I’ve never attempted my Mom’s dressing, but I could make this. Do you know what I just discovered that would be really good with this? Cream of Onion soup!! I had no idea Campbell’s made that. 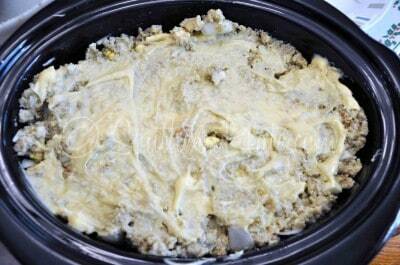 I found it at the store the other day and made a double batch of our Chicken Stuffing Bake with one can each of Cream of Onion and Cream of Chicken. It was delicious! With hubby not liking onions, it was a good way to get some in there! Yea! Someone else besides me that still uses just sage…not poultry seasoning! Rick only likes it if there is enough sage in it that the dressing has a green tint to it! Just the way I make it for him! 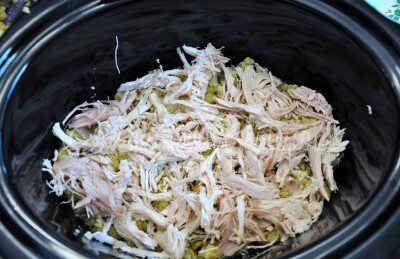 I have this in the crockpot now! I used a 9×13 of cornbread, but mine looked more runny than yours did. What consistency is best? I added almost 4 cups of broth, so maybe too much. Moist is good! It’ll soak up a LOT. hope you like it! Awwww, Christy! ~shucks~ Was happy to make sure you had some fine white corn meal in your pantry…or ‘Christy’s corn meal’ as we refer to it now! This recipe looks and sounds so yummy! Thank you for sharing! 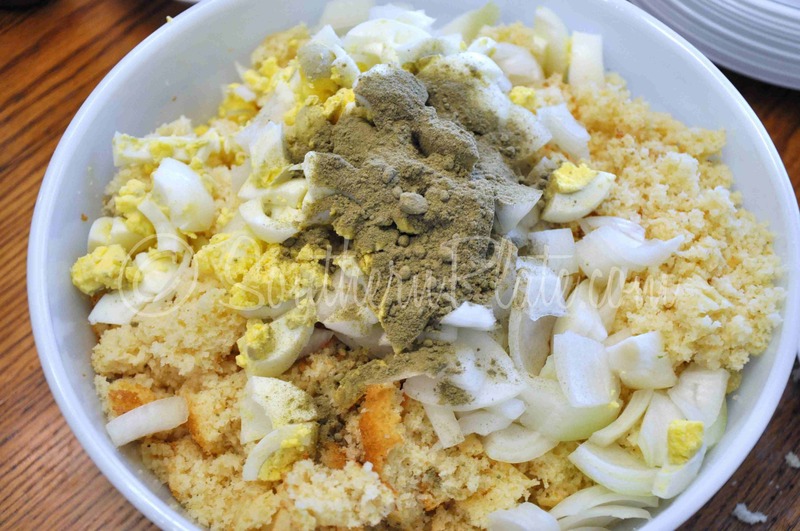 Your recipe is like mine except I add celery, onions, biscuits and 1 can of evaporated milk to my crumbled up cornbread. I have to make dressing for every family event. It is so yummy. I don’t add turkey to the dressing. I’ve noticed a lot of your recipes are just like mine! I guess cause we’re both from north Alabama. I’m in Hartselle. 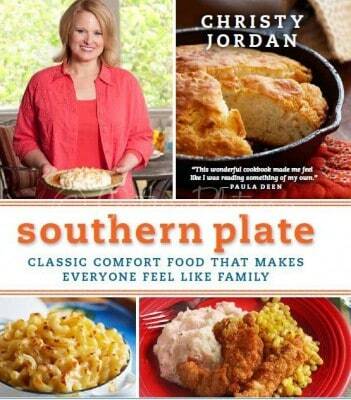 Can’t beat good ole Southern cooking. This is the first recipe I mixed from your cookbook about 3 weeks ago. Every Tuesday all of the kids and mother-in-law come for supper and I made it again…only doubled and every bit was eaten!!! 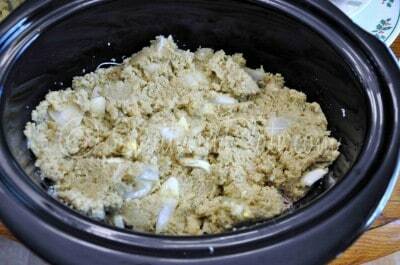 It is very similar to my mother’s recipe with celery. I didn’t miss the celery at all. I have been waiting for your stuffing recipe! I almost e-mailed to request it a few months back. 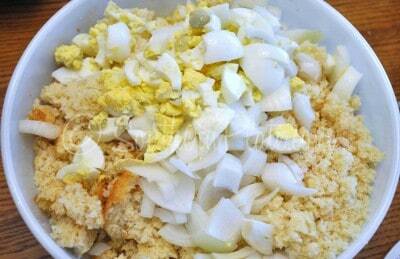 Every year I have tried a diffrent cornbread stuffing recipe trying to find the best one. Your recipe sounds delicious! I may have to make a half recipe to try before Thanksgiving! Thanks! This dressing is so good! I’ve fixed it twice, and it’s the best I’ve ever made. I’m typically a bread-stuffing kinda gal but this looks so yummy AND easy, I’m going to try it! Thank you! I make my cornbread dressing using cornbread (yellow cornmeal) and some white bread )that has been drying out, saute onion and celery, sage and salt and pepper to taste using broth from the turkey. Why put turkey in with your dressing when you would be having a turkey??????????????? Ummm, cuz it’s good!! LOL!! Can’t do the sage (it really gives me indigestion). Noticed there was no cranberry sauce. Gotta have cranberry sauce with dressing … ALWAYS! 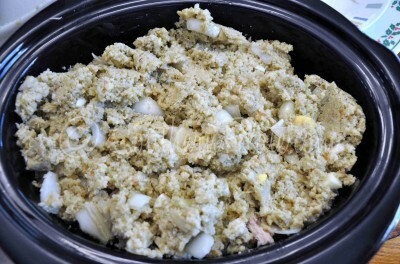 I’ve searched for the ideal stuffing to go with my Thanksgiving Meal and this one if going to be yummy. You haven’t let me down yet…Thanks…. This is such a great idea to cook the dressing in the crock pot! I basically make the same dressing only I have always put it in the oven. Now that just makes more room in the oven for PIES!!! I still pour my bacon grease in the coffee can, just like my Grandma did! Maybe it’s an Arkansas thing?! LOL! Pig Sooie! Am from Missouri and have always used a coffee can for my bacon grease. I use it also to fry pork chops and breaded sirloin steaks in as well. I HAVE NEVER COOKED DRESSING IN A CROCKPOT BEFORE. VERY INTERESTING. 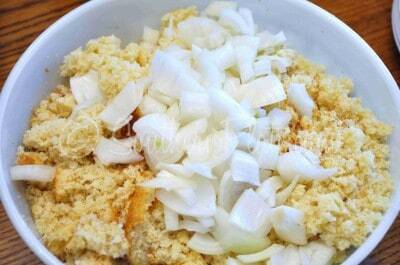 I SAUTE MY ONIONS, AND CELERY TILL TENDER AND THEN ADD TO THE CORNBREAD CRUMBS. I DO ADD THE CREAM OF CHICKEN AND CREAM OF CELERY SOUP IN MINE, ALSO ADD 2 RAW EGGS ALONG WITH THE BOILED EGGS. DO DO THE SAGE THING FAMILY DONT LIKE THE SAGE TASTE. 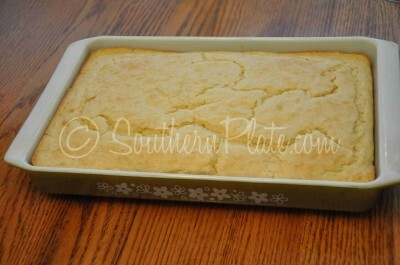 ALWAYS USE FRESH HOME MADE CORNBREAD. USE THE BROTH FROM A HEN AND ALSO ADD CHOPPED CHICKEN IN MY DRESSING. YUMMY. My MIL makes the best of both worlds–crunchy and moist. She puts the dressing in the pan, then uses her hands to make it into little pointy peaks. Then, she pours the broth into the side of the pan about halfway up the dressing. Dare I say that it’s better than my mama’s?? (same recipe, but broth all mixed in completely). At least I married someone from the same general area as me, and our dressing recipes are very similar. My brother married a yankee, and they have *gasp* stuffing. My marriage would never have survived that. Some friends were telling me about a sandwich they got at a restaurant in Pigeon Forge recently. It was turkey between dressing patties on bread (I don’t remember what kind) and the sauce was cranberry sauce mixed with mayonnaise! Sounded different but yummy. Pan fried dressing patties is now our favorite way to have dressing! I made this recipe but we all realized we like crunchy dressing best. I remembered your comment here and grabbed a frying pan and some oil and started making some patties! Thanks for the idea! Never would have come up with that one. Tonight had leftover patties from an office party with Chicken Pot Pie insides poured over the top. Very tasty. Can you add oysters to this-we always had oyster dressing for Thanksgiving. This recipe looks so good. I’ve been trying to find a recipe that I like that doesn’t turn out so dry and dense. This looks perfect. I love that you have meat and boiled eggs in it. That’s the way that my Mema fixes it. She uses chipped up pork chops that she’s boiled up. I’m going to give this a try this weekend. If we like it, it will be another thing off my recipe “bucket” list. I need to make dressing for 100 help me to modify this recipe please sounds yummo! This looks so good and sounds so easy. 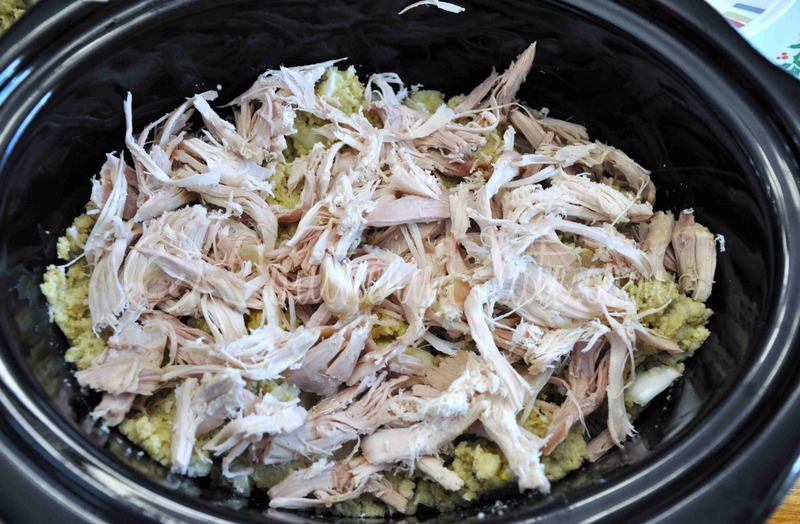 I am all for anything that is made in the crockpot! 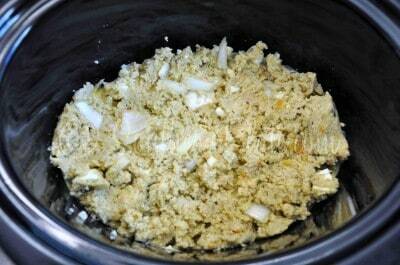 My Momma always made it with breakfast sausage (scramble it up and mix it right in). Mmmm… I don’t know if that came from my grandma’s Kentucky roots or my Momma’s Yankee side…?